The Missouri Department of Transportation reports its maintenance crews were able to make steady progress clearing central Missouri roads today in the wake of the area’s second major snow storm of the year. MoDOT officials are thanking motorists for their patience and for staying off of area highways as much as possible, which allowed crews to move quickly to plow roads. Green means clear, blue means partially covered, and purple means covered. Visit www.modot.org for more. The central area’s major routes – including Interstate 70 and Routes 63, 54 and 50 – were clear by noon, which enabled crews to begin working on the lettered and numbered routes in the early afternoon. Crews will continue to work through the night to clear those routes, so drivers still need to keep their guard up. Silvester said motorists should also be on the alert for slick patches of black ice caused by melting snow that refreezes when temperatures drop. Howard, Boone, Cooper and Moniteau counties received the heaviest amount of snow. Downed power lines were an issue in the storm because the snow that fell was wet and heavy. Two rest areas along I-70 near Boonville remain closed due to downed power lines blocking their entrances. 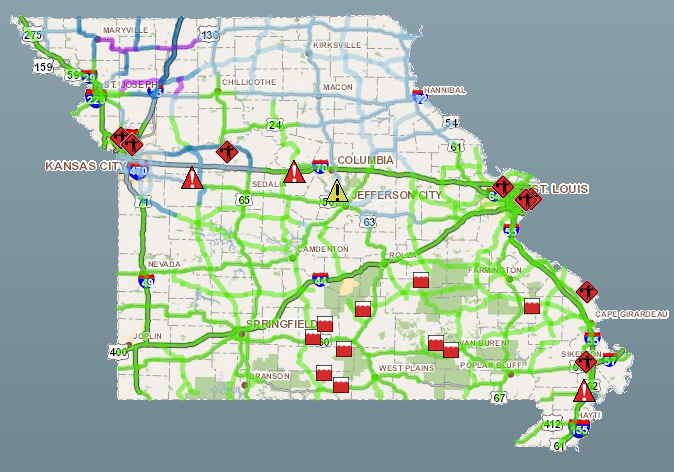 Motorists can continue to get the latest road conditions by checking out MoDOT’s Traveler Information Map at www.modot.org or by calling toll-free 1-888-275-6636. Tim Chojnacki, maintenence liaison engineer with MoDOT, says all roads in the northern part of the state are still at least partially covered. He says because crews are still out, chances for frozen roads later tonight are lessened despite the wet slushy snow. He’s asking motorists to give snow plows plenty of room to let them do their job, and says obviously driving behind a snowplow is better than in front of one, so passing them isn’t the best idea. Once roads are cleared, crews will work to clear piles pushed up against guardrails and on bridges as well as the shoulders. He says because crews will be out all night, the chemicals, salt and beet juice they’re using on the roads should prevent much refreezing as temperatures drop overnight.